More National High School Records and National Age Group Record was broken this evening at the FSPA High School Invitational in Florida. Last year, at the same meet, the Bolles School relay of Ryan Murphy, Santo Condorelli, Joseph Schooling, and Josh Booth, broke not one, but two High School National Records in the 200 freestyle relay and the 400 freestyle relay. This year Joseph Schooling got off to a great start, winning the 200 IM, missing the Public High School National Record in the 200 IM by only .20. 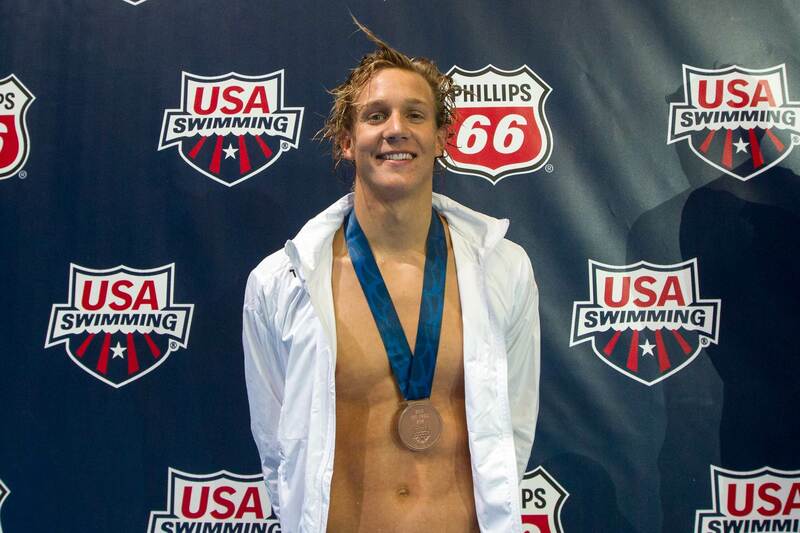 Shortly after, Clay High School senior Caeleb Dressel broke the National High School Record in the 50 yard freestyle. At this mid-season meet, with little-to-no rest, Dressel swam a 19.36. That broke the 19.43 done by Vlad Morozov of Torrance High School in California. After splitting a 24.99 50 yard breaststroke split (unbelievably fast for a high school swimmer in its own right), Dressel came back about 20 minutes later to break his first ever National High School Record, as well as the 17-18 USA Swimming National Age Group Record. The old 17-18 National Age Group Record belonged to Seth Stubblefield, who was a 19.41 as a freshman at Cal in 2012, and Dressel only turned 17 just over a month ago. Dressel’s potential now becomes truly terrifying. If he’s going National High School Records mid-season, and if we can draw any comparison between the improvements of the Bolles-trained swimmers in 2012 at this meet and their state meet (he swims for Clay High School, but trains primarily under Jason Calanog and the Bolles club team), there is a distinct possibility of a sub-19 second 50 yard free. Then the 100 butterfly came up. Both Dressel and Schooling were racing each other. Dressel touched the wall first with a time of 45.89. Schooling was second in 46.20. Luckily, because Dressel goes to public Clay High School, though he trains with Bolles’ club team, and Schooling goes to Bolles, which is a private school, both will have their name on the National High School Record board. Dressel took down Connor Black‘s record of 46.71 and Schooling improved his record time from last year of 46.50. Dressel and Schooling now have the 2nd and 5th fastest swims of all time in the 100 butterfly for the USA Swimming 17-18 age group. 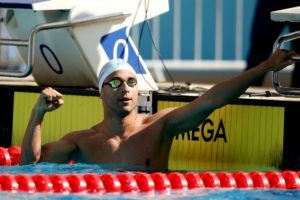 Schooling and Dressel were not the only swimmers with impressive times in Florida today. In the women’s 200 free, three swimmers were under 1:50. Michelle Turek won with her time of 1:49.19. CeCe Williams touched second at 1:49.34 and Jessica Hodgson was 1:49.81. Williams has won several state championships, and is one of the favorites to win this event at the state championship again this year. This year, though, her Chiles High School stays in 3A, while Turek’s Eastlake moves up to the new 4A classification. Willliams was 1:47.5 in the 200 freestyle last year. Turek is a junior this year, and is already closing in on her best 200 free time of 1:48.11 at an in season meet. Turek won her second individual event of the night, posting a 51.35 in the 100 freestyle later in the session. On Saturday, Cece Williams later won the 500 freestyle in a time of 4:53.03. Nazareno Boscaino from East Lake won the men’s 200 freestyle in a time of 1:41.31. He earned his second win of the night in the 500 freestyle, touching in a time of 4:29.08. Sydney Pickrem and Darby Goodwin were first and second in the women’s 200 IM, touching the wall at 2:04.10 and 2:05.21. Kasey Schmidt won the women’s 50 freestyle in 23.42.
Cooper Hoffman won the men’s 100 freestyle in a 46.54. The women’s 100 backstroke was won by Madeline Hess in a time of 55.66. Elise Haan touched second in a time of 55.82. In the men’s 100 backstroke, Dakota Mahaffey won with a time of 50.85. John Farese and Ryan Peters were also under 52 seconds, finishing second and third. Olga Lapteva won the womens 100 breaststroke in 1:05.67. 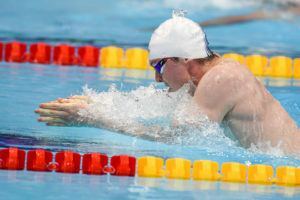 In the men’s 100 breaststroke, three swimmers were under 1:00. Joshua Chen won in 59.20, Corey Klemm and Jason Tillotson were second and third. To finish the evening, Caeleb Dressel led off the 400 freestyle relay, splitting 43.13. He was .50 off of the National High School Record in the 100 freestyle. The Bolles School won the relay, but a major contribution of their 3:06.38 came from their leadoff leg. The results say that it was Luke Georgiadis, who was 3rd in the 100 free, but our inkling is that Schooling actually swam that leg. Whoever it was led off the relay for the Bolles School in 43.97. This was a very fast meet, especially considering that this was an in-season meet. It is exciting to see these times coming out of Florida, and I am excited to see what these kids can do when they are suited, shaved, and tapered!! Congratulations to everyone who participated in the FSPA High School Invitational. Full results are avaialable on Meet Mobile. My guess is that Bolles’ leadoff was Joseph Schooling at 43.97. Luke Georgiadis was 47+ in the 100 free individual event. Old dawg – I suspect your correct. Asked coaches to confirm, but updated the post to acknowledge that fact. Caeleb goes to Clay. Schooling goes to Bolles.